Warp is defined as any deviation from a true or plane surface, including bow, crook, cup, twist, or any combination thereof. Warp restrictions are based on the average form of warp as it occurs normally, and any variation from this average form, such as short kinks, shall be appraised according to its equivalent effect. Bow – a deviation flatwise from a straight line drawn from end to end of a piece. It is measured at the point of greatest distance from the straight line. Crook – a deviation edgewise from a straight line drawn from end to end of a piece. It is measured at the point of greatest distance from the straight line. greatest distance from the straight line. Twist – a deviation flatwise, or a combination of flatwise and edgewise, in the form of a curl or spiral, and the amount is the distance an edge of a piece at one end is raised above a flat surface against which both edges at the opposite end are resting snugly. Warp develops as wood is dried. To understand the causes of warp it necessary to have a basic understanding of how changes in moisture content of wood affects shrinking and swelling of wood. The amount of water in wood is called the wood moisture content (MC).The moisture content (MC) in wood is actually a comparison. We compare the weight of water that is in the wood to the weight of the dry wood itself. MC of wood is a percentage, calculated by dividing the weight of water in the wood by the weight of that wood if it were completely dry. Green softwood lumber can have a moisture content approaching 200% that is, the weight of the water is twice the weight of the dry wood substance. Wood is considered dry when the weight of the water left in the wood is less than 19% of the weight of the dry wood. When logs are cut into lumber the wood is considered to be in its “green” condition. This means that the wood fibers are still fully saturated and the lumber will be straight and flat. This green lumber contains moisture in two forms, “free water” in the cell cavities and as “bound water” in the cell walls. 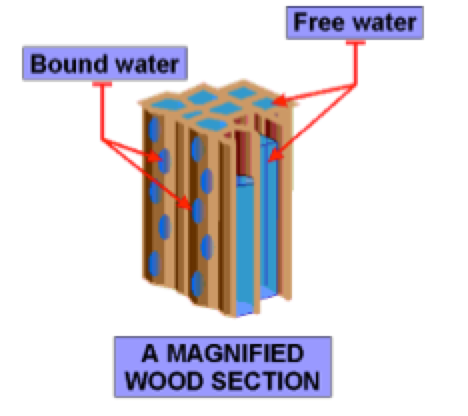 When the green wood begins to dry the bound water in cell walls will remain saturated until the free water has been evaporated. Once the free water is gone, the bound water is gradually released from the cell walls. The point at which evaporation of the free water from the cell cavities is complete and when the cell walls begin to lose their moisture is called the fiber saturation point (FSP). This point occurs between 25 and 30 percent moisture for most softwood species. Wood only changes shape when it gains and/or loses moisture at levels below the FSP. It swells as moisture content increases and shrinks as moisture content decreases. This is because below the FSP all moisture is bonded to the cell walls, which act like sponges, swelling when water is added and shrinking as they dry. Wood is hygroscopic. This means that wood acts like a sponge, it will gain or lose moisture as changes occur in the temperature and humidity of the surrounding air, – and in doing so, wood will always reach a moisture content that is in balance (at equilibrium), with its surrounding environment. This moisture content is called the equilibrium moisture content or EMC. Wood shrinkage is greatest in the direction of the annual growth rings (tangentially), somewhat less across the rings (radially), and very little along the grain (longitudinally). Longitudinal shrinkage is usually too small to be of consequence. This inequality of shrinkage in these three directions causes wood to deform as it dries. 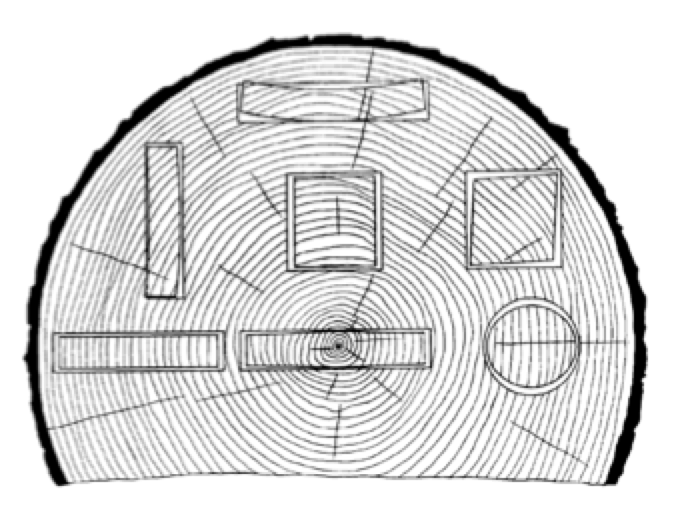 The amount and type of deformation of a piece of lumber varies depending on the orientation of the annual rings. 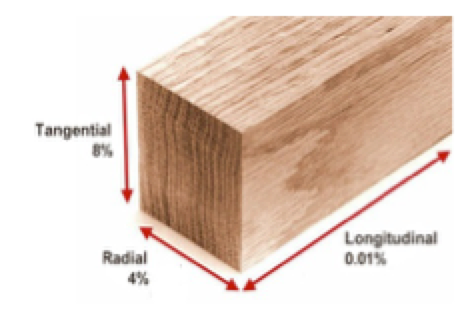 The combined effects of radial and tangential shrinkage can distort the shape of wood pieces because of the difference in shrinkage and the curvature of annual rings. The major types of distortion as a result of these ef­fects are illustrated in the Figure to the right. wood, and is typically found on branches and leaning stems. It is characterized, aside from its distinguishing color, by being hard and brittle and by its relatively lifeless appearance. It is the result of the tendency of the growing tree to equalize stress in trees. 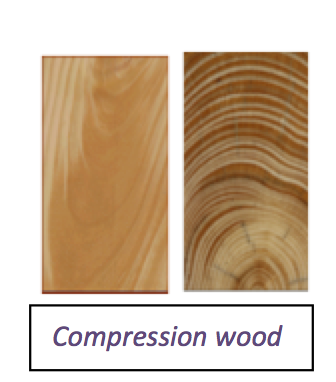 Compression wood has excessive longitudinal shrinkage and can occur in the same board with normal wood. 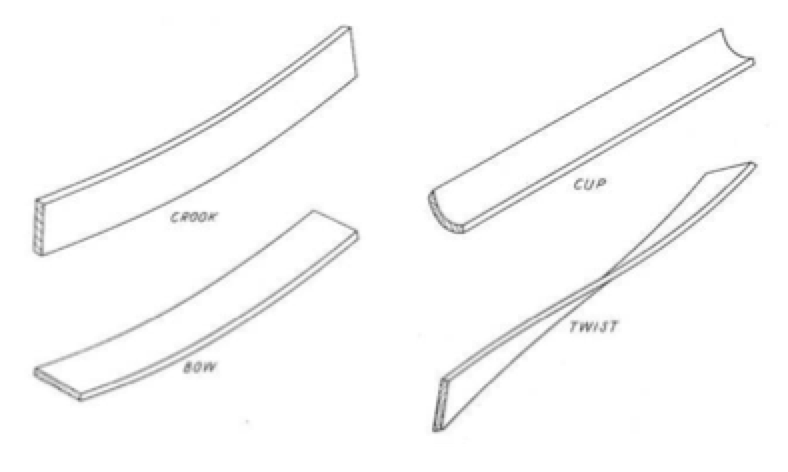 When this happens, the compression wood shrinks in length more than the normal wood and causes warp, particularly bow and crook, as well as compression failures in the piece. first 10-20 years of growth in the inner portion of the stem extending outward from the pith. It almost always is produced within the area of the living crown. The two most damaging characteristics of juvenile wood are that it will shrink and swell along the grain as moisture content changes and it is not as strong as then mature wood of the same tree. Juvenile Wood has a higher longitudinal shrinkage like compression wood and results in wood that has a tendency to warp, split, and check. Drying practices and grading efficiency will also affect the amount of warp present. In modern sawmills every effort is made to kiln dry lumber at high temperatures quickly with attention to all the details that effect quality such as stacking, air flow, drying time, heat and relative humidity. After drying the lumber is graded. The final product should conform to the grade rule limits for warp as well as all other defects and characteristics when graded by competent and qualified graders. During the grading process the graders down grade and trim pieces with excessive warp due to the drying process and/or due to the natural characteristics of the wood. To minimize shrinkage, SPIB’s Standard Grading Rules for Southern Pine Lumber require dimension lumber 2″ or less in thickness to be kiln-dried or air seasoned to a moisture content not exceeding 19%. This will result in an average moisture content of about 15% at the time of manufacture. If individual pieces, or whole kiln loads of lumber, are above 19% MC when dressed and graded, then some or many of these pieces will not have dried enough to exhibit their maximum shrinkage and warp. Wood in use over a period of time attains an equilibrium moisture content (EMC) corresponding to the humidity and temperature of the surrounding atmosphere. Wood used indoors will eventually stabilize at 8-14% moisture content; outdoors at 12-18%. The greater the difference is in MC at time of dressing and the final EMC the greater the potential is for additional shrinkage, – as the lumber continues to dry and warp after dressing, grading, packaging, shipping and in use. Lumber that was dressed and graded at high moisture content will be undersized when it reaches a normal emc and can be identified as such by measuring its thickness and width. Shrinkage of softwood lumber across the grain averages about 1 per cent for each 4 per cent change in moisture content. Lumber that is not dried to 19% or less at the time of dressing and grading is considered below standards and cannot be grade stamped. Sometimes lumber is rewetted during the transportation and storing process. When this happens pieces are exposed to moisture at different rates. The lumber on the outsides of a package can become very wet and begin to swell on the exposed surfaces while the interior surfaces and interior pieces remain relatively dry. If the lumber is left exposed to the elements during shipping, on the storage yard, and/or at the job site, these differences in re-wetting and drying due to changes in the weather will lead to deterioration in terms of differential swelling and shrinking leading to warp, checking and splitting. If the wood is wet from rain and high humidity when it is put into place, it will eventually dry to a moisture content approximating that of the conditions under which it is used. This drying in place will be accompanied by shrinkage. In a house, this shrinkage may cause loosening of fastenings and settling of the building with resulting plaster cracks, drywall nail popping, and unsightly openings around trim and moldings. Excessive shrinking of studs, joists, plates, sheathing, and siding loosens fastenings, and may reduce the mechanical stiffness of walls. If wood is dried too far below the average moisture content it will reach in use, swelling may cause drawers, windows, and doors to stick. Proper drying, and grading, will provide lumber straight enough for the intended use. Proper receiving, storage, handling, and installation of lumber after delivery will help maintain material quality during construction and service life. To learn more about the amount of warp allowed in each grade of dimension lumber go to: http://www.spib.org/wood-services/elearning. These courses will give you a complete understanding of how all the defects and characteristics of Dimension Lumber are graded. To control warp and ensure proper product performance at the job site follow some simple rules at: http://www.southernpine.com/using-southern-pine/proper-lumber-storage/.